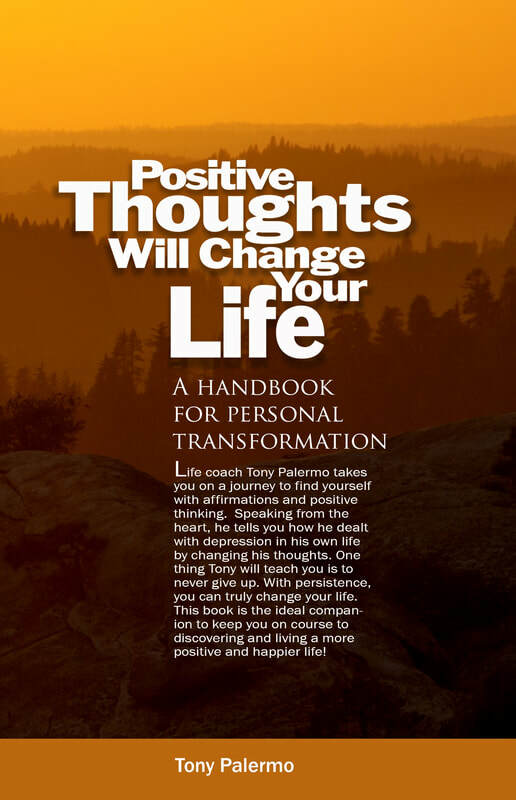 Today we are interviewing Tony Palermo about his self-help book "Positive Thoughts Will Change Your Life." My name is Tony Palermo and I’m a certified life coach based in California. I’m 38 years old and grew up in northern California. I went to Butte College to get a few two-year degrees and went on to get my four-year degree at California Southern University down in Costa Mesa near the Los Angeles. Describe your new book, “Positive Thoughts Will Change Your Life,” in a few sentences. This book is a guide to help people live a happier healthy life. I wrote this book to help people and to tell my story of why I became a life coach. Who do you think would benefit most from reading this book? This book with benefit anyone who is looking to change his or her life for the better. You write about your own struggle with depression and how you overcame it. Can you give us some insight into your journey and what you learned from it? I first started to feel depressed after a breakup when I was around 20. I could not shake the depression and it stayed with me for many years. I tried a lot of different things to help but nothing really got me back to feeling 100 percent. I even tried affirmations about 10 or so years ago but they did not work for at the time. This was due to the fact that I did not know how to do affirmations the correct way. After I meet my life coach and worked with him for a while I really started to feel better. I’ll never forget walking into his office and I just told him I really have not felt low in about three weeks. This was very unusual for me since I normally don’t go a few days without feeling low. It was a turning point for me and I owe it all to life coaching. My life coach taught me how to do affirmations the correct way and to change my negative thinking to positive thinking. These two things change my life for the better. A major topic in your book is the power of affirmation. For people who aren’t familiar with affirmations, can you explain what they are and why they are important? Affirmations are anything that we talk about or think about. A good example is when I was feeling depressed I would say, “I feel depressed.” I said this every day because that’s how I was feeling. In turn, that’s what I got in my life. I manifested more depression because I was saying “I feel depressed” when I changed to a positive affirmation like “I feel wonderful, my body is perfect” my whole life change. My point here is you can say positive and negative affirmations and the universe will respond and give you what you are thinking about. My advice to everyone is really think about what you are saying and if it’s a negative statement changes it to be positive. You also write about the law of attraction. Can you tell us about the law of attraction and the benefits for the average person? The law of attraction basically means whatever you think about your going to get. So the law of attraction and affirmations go hand in hand. You say the affirmation and the law of attraction goes to work by getting what you are thinking about. So when I say, “I feel wonderful, my body is perfect” the law of attraction will go to work with that positive affirmation and it manifests it in my life. A person can use this for anything in the world. For example, if someone wants a new job a lot of the time people will say, “I hate my job” or “I want a new job” what people have to do is get very specific about what they want. If a person says, “I hate my job” the person will attract more of that. Nothing good will come of that negative affirmation. What a person can say instead is, “Yes, I have a great new job that I love. I get paid a great wage and I have great co-workers.” When you say this positive affirmation the law of attraction will go to work in your life and attract you a great new job that you will love. In addition to writing, you do life coaching. Can you walk us through how you approach helping someone get their life where they need to be? First I figure out what the client needs. We work together in figuring out what he or she needs to get there life back on track. Sometimes this is working with affirmations and turning negative affirmations they are saying into positive affirmations. Sometimes this is working with forgiveness, forgiveness of themselves or of other people. Making sure the client knows they are worthy of what they want. A lot of the times clients don’t think they deserve to live the life they want. This is not true at all. My main goal as a life coach is to get clients back on track so they love the life they live. Everyone deserves to be happy in their life. If someone has a question about your life coaching or book, is there a way to reach you? Thanks for speaking with us! Is there anything else you'd like to add? I would just like to say thank you for letting me tell my story and remind your readers to always think in a positive way. When you think in a positive way long term you will manifest positive results.